Sports photographer David Martin, an avid astrophotographer, captured this amazing view of a West Virginia house for sale with a Milky Way backdrop. Martin used a spotlight to illuminate the house in the view. The Milky Way arcs above a spotlight-illuminated house in a beautiful view captured by a veteran night sky photographer and self-styled "astro-paparazzi." 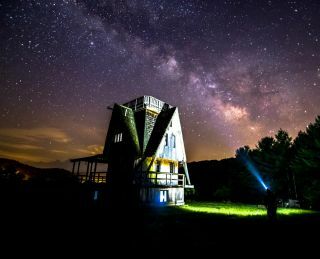 Virginia photographer David Martin took this photo of the Milky Way stretching over a house for sale in Monroe County, West Virginia, on the property of the Creekside Resort and Spa. By day, Martin is the sports editor of a weekly newspaper in Giles County, Virginia, but at night he scopes out local settings and posts photos of the stars to his Facebook page, Night Watchman Photography. With a camera that can do long exposures, a wide-angle lens and a tripod, it's not so hard to capture vivid images of the night sky, Martin said. For this image, he used a Canon 6D at ISO 4,000, and his wide-angle lens at 2.8, exposing for 20 seconds. Martin actually got his start as a star photographer by mistake; he had been trying to take a photo of lightning bugs, and didn't even have a tripod. "While I did get a lightning bug eventually, the capture of a star was completely unintentional, and that accident opened up a side of photography that I had never known about previously," Martin said. He quickly acquired a tripod and has become an avid sky photographer when conditions are clear, he said. "I'm somewhat of an astro-paparazzi now in my constant pursuit of capturing the stars," Martin said.